for each stage of your wedding day. As your wedding guests arrive and take their seats prior to the start of the ceremony they will be treated to a selection of beautifully-played relaxing light classical music and romantic movie themes. This will create a wonderful ambience and set the scene leading up to the arrival and entrance of the Bridal Party. Perhaps the most important music of the wedding ceremony, the Processional Music heralds the arrival and entrance of the Bridal Party and accompanies them during their walk down the aisle. 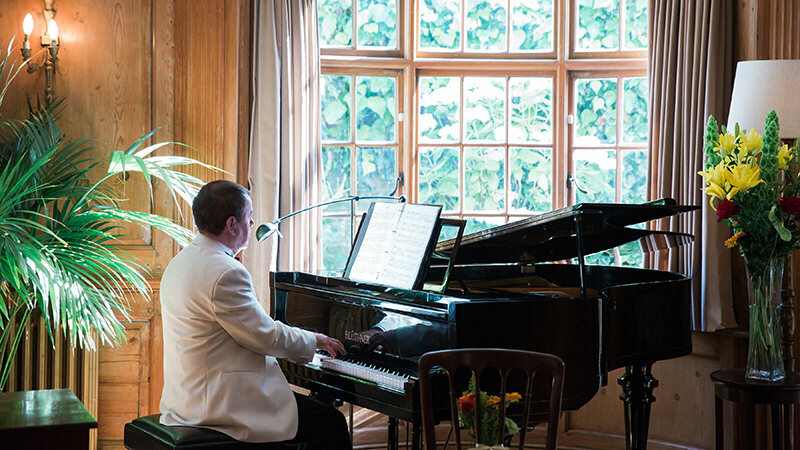 Mark Reeves has the experience and expertise required of a professional wedding pianist to ensure the music is played right on cue and brought neatly to a close at the appropriate moment. Atmospheric piano music is played in the background whilst the bride and groom attend to the legal formalities of the proceedings and the official wedding photographer captures the moment on camera. The amount of time this takes varies at each wedding ceremony, so having a wedding pianist perform live ensures that the piano music you've chosen will be tailored to fit perfectly. As soon as the wedding guests are invited to applaud and congratulate the Newly Weds, your professional wedding pianist, Mark Reeves, will launch into the piano music you've chosen to mark the end of the ceremony and the beginning of the celebrations! The music will continue to accompany the Bride and Groom as they make their way back down the aisle, followed by their guests. Once the wedding ceremony has finished, Mark Reeves will create the perfect atmosphere for celebrating your special day as you mingle and chat with your wedding guests during the champagne drinks and canapés reception. The live piano music can continue whilst your wedding photos are being taken, keeping everyone entertained until it's time to sit down and enjoy the wedding breakfast. Nothing can beat live romantic piano music for creating the perfect ambience during your wedding breakfast. Romantic ballads from yesteryear, contemporary love songs, romantic movie themes, light classical music...the finest piano solo music you could wish to have played especially for you as you share your wedding breakfast with your nearest and dearest. 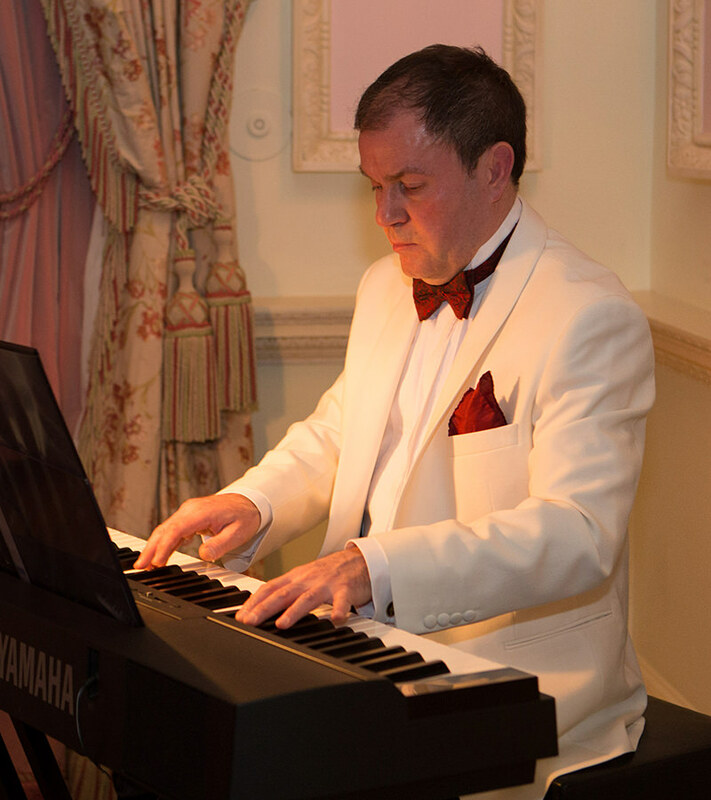 Mark Reeves is a professional pianist based in Horsham, West Sussex, available for hire as a wedding pianist at Civil Weddings, Civil Partnership Ceremonies and Asian Weddings in London and the South East of the UK. 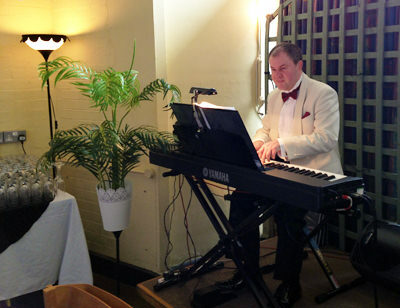 He has over 15 years' experience playing the piano at weddings, wedding anniversary dinner parties, birthday dinner parties, cocktail parties and corporate dinner functions predominantly in the South East of England (London, Surrey, East Sussex, West Sussex, Hampshire and Kent) but also in other regions of the UK (Berkshire, Bedfordshire, Hertfordshire and Essex) and in other parts of the world (Australia, France, Germany and Hungary). Mark Reeves is a classically-trained pianist and is also self-taught in Jazz, Rock and Pop styles. Over the years he has built a large and varied repertoire, covering most genres of music to suit most people's tastes - perfect for weddings and other special occasions such as Silver Weddings, Ruby Weddings, Golden Weddings, Birthday Parties, Cocktail Parties and Corporate Events. This may be the first time you have looked into booking a professional pianist for a special event, such as a wedding or a birthday party. "You were amazing! ", "The perfect music", "Very impressed" and "Very special" are just some of the views expressed by recent clients. Reading these testimonials from so many satisfied clients will reassure you that you'll be in very safe hands when booking Mark Reeves to play the piano for you on your special day. "Hi Mark, thank you for playing so beautifully - so many guests commented on how lovely the piano was and that it created a special atmosphere for the ceremony. I didn't manage to hear any of the preludal music so thank you for the list. Frank says it was all wonderful!" "Hi Mark, Thank you so much for playing yesterday. Sorry we didn't get a chance to meet properly. All our guests said you were amazing. Thank you again." "Hi Mark, Thank you so much for the perfect music, and all our guests were very impressed. It certainly made our wedding all the more special." "Hi Mark, thank you so much. You really made the ceremony very special. Thank you for the photos, they are fantastic." "Hi Mark, I just wanted to say how much we enjoyed your music on Sunday. Mum said she felt very special to have her own pianist!" "Thank you so much for your wonderful recitals, they went down a treat and helped to ease my nerves as the groom awaiting the entrance of the bride. Thank you for the lovely photo that you've sent also." "Hi Mark. Thanks so much for sending this and of course for playing such a lovely playlist. It created such a lovely atmosphere and we've had so many comments already that our guests really enjoyed it. Thanks once again for helping to make such a special day!" "Thank you very much for New Year's Eve. Made for a great atmosphere!" "Thank you so much Mark, was awesome." "Hi Mark. Thank you so much for yesterday - Eamonn and the guests really enjoyed it and said it was perfect. Thank you for the playlist - it's good to see what you played." "Hi Mark. We didn't get a chance to meet at the venue, but I would just like to say a huge thank you for today. You done an incredible performance and you made the day special for us. I hope to see you in the near future at some point for another family booking. Once again a huge thanks to you Mark. The best of the best for us. Thanks." "Hi Mark. I just wanted to drop you a message to thank you for playing at our wedding. We had an amazing day and your music really added to the atmosphere. We loved the songs that you chose and have had a lot of comments about how great you were. Thanks again." "Hi Mark! You were sensational! Thank you so much for playing! I know I was gutted that we didn't get to meet you but the guests loved you! We were on a tight schedule and were dragged out by the photographer for our shoot. Amir sends his regards too. If there is any way we can write you a review on your website or anything then please let us know. You had me in tears walking down the aisle. Cannot thank you enough!" "Thank you very much for your wonderful music during our ceremony. We had lots of comments about how beautiful the music was. Several people asked what you had been playing so the list below is very useful thank you! Your music was absolutely perfect for the setting and I think that it really contributed to wonderful memories that we have of our ceremony." "Just wanted to say thank you so much for playing piano at our wedding reception. Sad that Amit and I didn't get a chance to meet you but all my friends and family said you were amazing and really enjoyed the music. Thank you for the music list - very kind of you and much appreciated. We really had a great day, just went by so quickly. At least I know now whoever wants to book piano services I can recommend you." "Thank you so much for taking the trouble to send us the list of music played at our Afternoon Tea. I would not hesitate to recommend you to any of my family or friends. You played everything I had requested and more besides. Everyone was delighted with your playing, thank you." "Thank you so much for yesterday. You done a fantastic job, much appreciated. It turned out to be an amazing day, from start to finish, makes all the organising, stress and tears all worth it! Many Thanks again." "Rosie and I returned from honeymoon yesterday and I just wanted to thank you so much for the great job you did at our wedding. Your piano playing was just wonderful: the tunes, the volume, the timing - everything was just spot on. Many people who attended the wedding have remarked on how good your music was. It was worth every penny of your fee as you could not have been better. Thanks for helping to make our day very special." "Thank you, you played beautifully and it was just how I imagined." "I just wanted to say thank you for making our evening so special. Everything was perfect. And a special thanks for the last two pieces - Happy Birthday was just great, and of course 'Sherlock Holmes march' was a very nice surprise for all the guests. Once again thank you very much." "Yes we were indeed pleased with the piano music you played for us. As you can imagine it all goes so quickly. We can recall Chasing Cars mostly as we probably had more time during that point and we probably walked in a little too quickly and should have maybe let a Thousand Years play a little more but I still think it all sounded good. Having a piano at an Asian wedding can be a little controversial, specially for the first dance, etc but we liked it and we did get some positive feedback from those who appreciated it. The first dance is always a little awkward, being in the spotlight but I think the piano helped us. It's also good to hear that some of our guests gave you compliments for the drinks reception! Thank you very much for your email and playlist! I'm looking forward to the wedding video so we can also get to see you in action too!" "Wow, you were amazing, everyone loved you and thought you were fantastic. Mike and I just want to say a massive thankyou, you really helped complete our special day and we are definitely making a cd from the list of music you emailed me so thanks for that. It was lovely meeting you and getting to hear your breathtaking music we highly recommended you to a few people who are also getting married!" "I'm writing to you to say how much we appreciated your playing the piano at our Anniversary luncheon. Your attention to detail was particularly noted and many of our guests commented that the music was of their era, as many were around 50 years ago appreciating lovely songs! Thank you very much indeed." "Thank you so much for the music on Saturday. It was just perfect! Highly professional and sounding fantastic. The list of music is a lovely touch - we are very grateful. We will be recommending you!" "Thank you very much for the lovely music and for the kind thought of letting us have the list of other music played. We had a wonderful day and everything was as we had hoped. We have some lovely mementos and the music list will be added to them." "Thank you for coming to our Ruby Wedding Celebration and playing the piano for us. We were overwhelmed by the cards, gifts and donations (over £200) to Chestnut Tree House Hospice"
"Thank you so much for sending us the playlist, it is very thoughtful of you. Our guests loved your playing! Thank you also for being so patient with little Fernando's insistence on playing Deep Purple." "Thanks Mark for doing such a brilliant job - we really appreciated it!" "Thank you for coming to our wedding and being our pianist, everyone commented how fantastic you were and the music you played. Thank you." "We would just like to thank you very much for the music that you played at our wedding at South Lodge. It really did compliment the atmosphere and made it more special. The music flowed exceptionally well and the songs were all well suited." "Thank you so much for playing so beautifully during our arrival drinks and wedding breakfast. Everyone commented on how lovely it was to have music to arrive to and also in the background during dinner. You played everything we asked for and you are an incredibly talented musician. It was fantastic that everything was set up and in progress by the time we arrived and the music was non stop. Also, thank you for sending through your playlist after our wedding. Such a lovely touch. Perfect music to add to a perfect day! Thank you!" "Thanks for making Mum's 80th birthday celebration at The Ravenswood such a special occasion. Everyone thought your playing of the 'old standards' was exceptional and we will highly recommend your services to others." "Just wanted to write to thank you so much for playing the keyboard at our wedding reception. So many people commented on how good you were - the selection of music played and the performance! It really made the evening complete on what was a wonderful day for us. Many many thanks." "Many thanks for the great music for our party, not intrusive but lovely! John and I thoroughly enjoyed ourselves." "Thank you very much for all you did on Saturday - thoroughly enjoyed it and it was a lovely surprise for Stuart! I will pass the playlist of songs to Kate; as you say, it is good to have it as a memento of an absolutely lovely day. Thank you." "Geoff and I would like to thank you Mark for your incredible music session!! It was a great asset for our daughter's wedding reception - and we have had so many comments saying how lovely the music was. Thank you so much for the list of music played, Kate and Martin would certainly love a copy as would those who couldn't make the day. Once again, thank you." "Mark, Thank you for all you have done! Magnificent." "Thank you very much indeed for playing the piano on our wedding day. The music was beautiful and you created a lovely atmosphere." "Just wanted to say thank you again and also say thank you for providing us with the list of music - it's great to have a record of what was played. You were a pleasure to deal with and it's a shame we won't get to utilise your talents again! Thanks once again." "Thank you so much for your contribution to Helena and John's perfect wedding on Saturday 10th April, 2010. We loved that you were playing the grand piano whilst everyone filed their way through the hotel and out into the beautiful sunshine in Shelleys garden, bubbly in hand! You added sophistication to the setting and event. It was so thoughtful of you to bring the keyboard and amplifier so that we could continue to enjoy your piano playing whilst celebrating in the garden. I want you to know that you were much appreciated by all our guests. Thank you so much." "We would both like to thank you again for playing at our wedding on Tuesday, it was perfect, you did a fantastic job - you made our ceremony perfect! Many of our guests commented to us on how good you were, they were very impressed and all loved the music." "I just thought I would drop you a quick line to thank you very much for playing at our party on Friday. It added a lovely atmosphere and all the guests enjoyed it very much. I hope you will agree to play for us again in the future." "Thank you so much for playing the piano at our wedding reception at Bluebird. Your music was absolutely perfect and really added to the whole ambience of the evening. We had a fantastic time and thought you would appreciate knowing that the events manager at Bluebird was extremely complimentary about your playing." "Thank you so much for providing such beautiful music at my parents' birthday celebrations on Saturday. The repertoire was perfect as was your performance. My parents were thrilled - we had kept you as a surprise! There were lots of compliments flying in your direction so many, many thanks." "We just wanted to say a huge thank you for providing the beautiful music at our wedding last Saturday. We thought you played brilliantly and it was so nice to hear all our favourite songs on such a special day." "Thanks once again for your hard work and wonderful playing at Sally's wedding - it all contributed to the perfect day they had - we're still living the memory!" "Just thought I'd drop you a little thank you note." "Just wanted to say a big THANK YOU for playing at our wedding. It really made a big difference to us to have you play live rather than taped or cd and we had lots of lovely comments too." "Mark, thank you for making my day so special." "I am writing on behalf of the Fundraising & Social Committee of the Parish of Nuthurst & Mannings Heath to thank you so much for entertaining us so delightfully at the Sedgwick Park Open Day on June 22nd. The music was very much in keeping with the occasion and was enjoyed by all. The support you gave the event is very much appreciated." "Just back from our honeymoon, so a rather belated thank you for playing at our Wedding in Mannings Heath on 24 May. You were brilliant! The music was just right and was enjoyed by everyone. Hope the moving around between the garden and marquee was not too difficult - but it was lovely to be able to be in the garden. Our thanks again." "Just to formally thank you for stepping in to accompany Paul at such short notice on Tuesday. My members had a thoroughly enjoyable evening and loved your performance as I am sure you could feel from the floor." "We both wanted to say a big thank you for the music you supplied for our wedding on 17 August; it made the day truly special. We have had lots of comments from guests about how nice it was to hear the music playing and many of them recognised their own personal favourites that you put into your repertoire throughout the day. Your music was so good that it took some guests a while to realise that it was live music! Thank you so much for accommodating all our requests and for making the day memorable. I would highly recommend you to anyone thinking of booking a pianist." "Thank you so much for creating such a wonderful atmosphere for us - perfect! The day just flew by but it all went exactly as we wanted and you helped us create just the right mood - relaxed and intimate. We're sorry that we did not have more time to speak with you but just wanted you to know we really appreciated your performance as did our guests." "Many thanks for playing the piano for us at our wedding on the 19th May. We were so impressed by the quality of your playing and the music you chose for us. You made our day really special, many of our friends commented on how much they enjoyed listening to you. We would not hesitate to recommend you to others." "Thank you so much for bringing your piano to the Sedgwick Park Open Day last Sunday. Your music-making gave great pleasure and added much to the atmosphere of the occasion. Your help at the event was very much appreciated." "Thank-you for taking the time to learn the pieces and help us with the [grade 7 flute] exam (especially Mathias!). We all passed!" "I am writing to thank you for playing the piano at Mrs. Stenton's 90th birthday party on 24th February in Haywards Heath. Everybody remarked how lovely the evening was and nice it was to have a pianist playing for the evening. Well done, and thank you very much." "Just a quick note to say thank you for today ... everybody really enjoyed your music and it was perfect for the party ... it was really good to meet you and hopefully we will see you again." "Just wanted to say thank you so much for playing at our wedding. We both thought you were amazing. Thanks for staying on for the extra time. We will be recommending you to all of our friends. Once again thank you." "I would like to thank you on behalf of the patients and staff of the unit for the excellent entertainment you provided for our patients at the Christmas Party. All of the patients said how much they enjoyed the performance. Personally I was extremely grateful for your responsive manner; when we appeared to be facing an entertainment crisis and you bravely leapt into the breach. Without your help the day would not have been such a success, so thank you once again." "I am writing on behalf of the Fundraising & Social Committee of the Parish of Nuthurst & Mannings Heath to thank you so much for playing for us at Sedgwick Open Day last Sunday. It was so much in keeping with the era of the house and was very much enjoyed by all. The support you gave the event was very much appreciated." "Just a note to thank you very much for organising Sammy to play in our EPTA Concert. I thought he played extremely well with a real sense of rhythm and style." "Thank you for making this afternoon so special." "Your music added greatly to the occasion and was much appreciated by all." "I am writing on behalf of the Fundraising & Social Committee of the Parish of Nuthurst & Mannings Heath to thank you so much for providing such delightful music for us at the Sedgwick Open Day last Sunday. The pieces you chose were absolutely right for the setting and were very much enjoyed by all. Your help and support were greatly appreciated." "Reg and I are only just beginning to come down from Cloud 9, for it was such a wonderful day last Saturday and we do thank you for all your help in making it so. All the music fitted in so well with Nick and Sarah's script and we appreciated all the music that you had so carefully selected for our entertainment whilst lunch was being served. There were so many tunes from shows that we have seen that we recognised. We can appreciate that you must have put a lot of time and thought into compiling the program beforehand." "Thanks for your lovely piano playing and for all your help." "Thank you for playing at our wedding. It made the day much more special." "I am writing to thank you so much for coming to play the piano for us at the Sedgwick Open Day last Sunday. Your choice of music fitted the period of the house to perfection and people were full of praise for your playing. Your help and support were greatly appreciated." "Thank you so much for stepping in at the last minute." "Just a line to thank you very much indeed for your fabulous performance at the concert on 4th December. Your piano playing was certainly enjoyed by all those present." "Thank you very much for your contribution to 'The Shanty Singers' last week and your continual support throughout the previous weeks, it made such a difference to the group's musical talents. We really appreciated all you did and hope to see you again in the not too distant future. The singing group hope to continue starting again in September and may contact you to use your expertise. Once again thank you very much."